The 7777 Bareknuckle Flipper was inspired by the wildly popular and highly limited 0777 model by Zero Tolerance Knives. The Bareknuckle is Made in the USA version that has been slimmed down for a low-profile foot print while still retaining the striking visual design, ergonomics and cutting performance of the original. The Bareknuckle features a KVT bearing driven flipper operation, steel sub-frame lock construction and stonewashed 14c28n stainless steel blade. 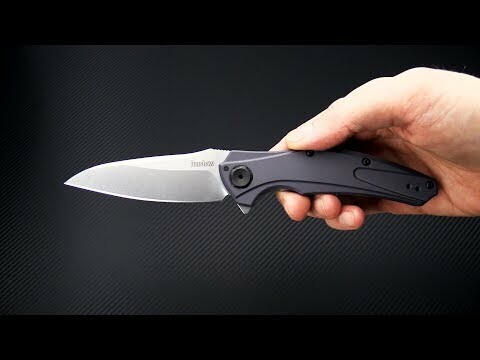 Brand new item direct from Kershaw Knives. Blade: The slimmed down profile of the Bareknuckle's blade enhanced piercing performance that is already excellent thanks to the full length top swedge and high height saber grind. The tall saber ground edge offers a tip that is durable and sharp while providing a fine, razor like edge on the stonewashed finish 14c28n blade. The blade rides out fast and smooth on KVT ball bearing pivot and has spine jimping for added traction. Handle: Machined and contoured Grey anodized aluminum handle scales deliver a comfortable grip with lightweight and durability to boot. Kershaw's patented Sub-Frame locking mechanism offers some of the lightest, most reliable lockup in the industry along with flawless operation and incorporates integral over-travel protection. 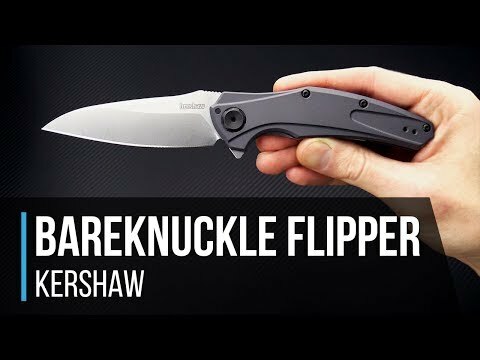 Black Torx screw construction with customized pivot hardware and a tumbled stainless steel deep carry clip (reversible, tip-up) round out the construction of this offering from Kershaw. Sandvik 14c28n: Very fine grained Swedish alloy offering a good combination of corrosion resistance, edge stability, wear resistance and strength.